Vesicoureteral reflux (VUR) is a condition in which urine flows from the bladder, back up the ureter, and back into the kidneys. Illustration of vesicoureteral reflux in a child, a condition in which urine abnormally flows back up into the ureters, causing repeated urinary tract infections. The normal flow of urine begins in the collecting system of each kidney. Urine then flows out of each kidney and into a tube called the ureter. Each ureter leads into the bladder, where the urine collects until it is passed out of the body. Normally, urine flows only in this direction. 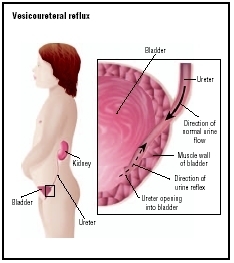 In vesicoureteral reflux, however, urine that has already collected in the bladder is able to flow backwards from the bladder, up the ureter, and back into the collecting system of the kidney. VUR may be present in either one or both ureters. Vesicoureteral reflux causes damage to the kidneys in two ways. The kidney is not designed to withstand very much pressure. When VUR is present, backpressure of the urine on the kidney is significant. This can damage the kidney. Second, the kidney is usually sterile, meaning that no bacteria are normally present within it. In VUR, bacteria that enter through the urinary tract may be carried back up the ureter with the urine. These bacteria can enter the kidney, causing severe infection. VUR mostly occurs in the prenatal stage and may be observed at birth (congenital), although it may not be detected until an infection heralds its presence. VUR may run in families. The condition affects about 1 percent of all children. More boys than girls have VUR. Most cases of VUR are due to a defect in the way the ureter is implanted into the bladder. The angle may be wrong or the valve (which should allow urine only one-way entrance into the bladder) may be weak. Structural defects of the urinary system may also cause VUR. These include a situation in which two ureters leave a kidney, instead of the usual one (duplicated ureters) and in which the ureter is greatly enlarged at the end leading into the bladder (ureterocele). VUR alone does not usually cause symptoms. Symptoms develop when an infection has set in. The usual symptoms of infection are frequent need to urinate, pain or burning with urination, and blood or pus in the urine. Occasionally, VUR is suspected when a child has a difficult time becoming toilet trained. In these cases, the bladder may become irritable and spastic, because it is never totally empty of urine. When the kidneys have been damaged, high blood pressure may develop. Over time, severe damage and scarring of the kidneys leads to kidney failure. Urinary tract infections are diagnosed through laboratory examination of urine samples. Kidney size and scarring can be assessed through ultrasound examination of the kidneys. Grade I: VUR enters just the portion of the ureter closest to the bladder. The ureter appears normal in size. Grade II: VUR enters the entire ureter and goes up into the collecting system of the kidney. The ureter and the collecting system appear normal in size and structure. Grade III: VUR enters the entire ureter and kidney collecting system. Either the ureter or the collecting system is abnormal in size or shape. Grade IV: Similar to grade III, but the ureter is greatly enlarged. Grade V: Similar to grade IV, but the ureter is also abnormally twisted/curved, and the collecting system is greatly enlarged, with absence of the usual structural details. Once VUR has been diagnosed, its progress may be followed with a nuclear scintigram, in which a radioactive substance is put into the bladder via catheter, and a gamma camera takes images that reveal the presence and degree of VUR. This test exposes the child to less radiation than does a standard VCUG. Doppler ultrasound techniques were as of 2004 under study as a radiation exposure-free alternative to VCUG. Treatment depends on the grade that is diagnosed. In grades I and II, the usual treatment involves long-term use of a small daily dose of antibiotics to prevent the development of infections. The urine is tested regularly to make sure that no infection occurs. The kidneys are evaluated regularly via ultrasound and VCUG (every 12 to 18 months) to make sure that they are growing normally and that no new scarring has occurred. Grades III, IV, and V VUR can be treated with antibiotics and careful monitoring. New infections, scarring, or stunting of kidney growth may result in the need for surgery. Grades IV and V are extremely likely to require surgery. Surgery for VUR consists of reimplanting the ureters into the bladder at a more normal angle. This adjustment usually improves the functioning of the valve leading into the bladder. When structural defects of the urinary system are present, surgery will almost always be required to repair these defects. Prognosis is dependent on the grade of VUR. About 80 percent of children with grades I and II VUR simply grow out of the problem. As they grow, the ureter lengthens, changing its angle of entry into the bladder and resolving the reflux. The average age of VUR resolution is about six to seven years. About 50 percent of children with grade III VUR require surgery. Nearly all children with grades IV and V VUR require surgery. In these cases, it is usually best to perform surgery when the patient is relatively young, in order to avoid damage and scarring to the kidneys. While as of 2004 there was no known method of preventing VUR, it is important to note that a high number of the siblings of children with VUR also have VUR. Many of these siblings (about 36%) have no symptoms but are discovered through routine examinations prompted by their brother's or sister's problems. It is important to identify these children, so that antibiotic treatment can be used to prevent the development of infection and kidney damage. It is important that parents of children with VUR understand the importance of following the instructions for antibiotic administration. Although their child may not appear at all ill, the antibiotics are crucial to protecting the health and development of their child's kidneys. Children with VUR should also be monitored for the development of constipation , which can complicate the VUR. Problems with bladder emptying can make toilet teaching a slower process in children with VUR. Bladder —The muscular sac which receives urine from the kidneys, stores it, and ultimately works to remove it from the body during urination. Reflux —The backward flow of a body fluid or secretion. Indigestion is sometimes caused by the reflux of stomach acid into the esophagus. Ureter —The tube that carries urine from the kidney to the bladder; each kidney has one ureter. Atala, Anthony, and Michael A. Keating. "Vesicoureteral reflux and megaureter." In Campbell's Urology , 8th ed. Edited by Meredith F. Campbell et al. St. Louis, MO: Elsevier, 2002. "Vesicoureteral reflux." In Nelson Textbook of Pediatrics. Edited by Richard E. Behrman et al. Philadelphia: Saunders, 2004. Austin, J. "Vesicoureteral reflux: Surgical approaches." In Urology Clinics of North America 31 (August 2004). Cooper, C. "Vesicoureteral reflux: Who benefits from surgery?" In Urology Clinics of North America 31 (August 2004).